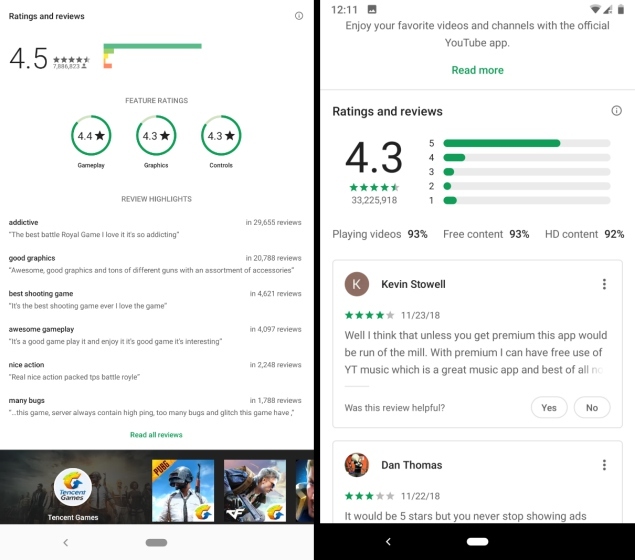 The Google Play Store received a fresh coat of paint earlier this year, where it launched itself in the direction of using an all-white UI and its signature green color. 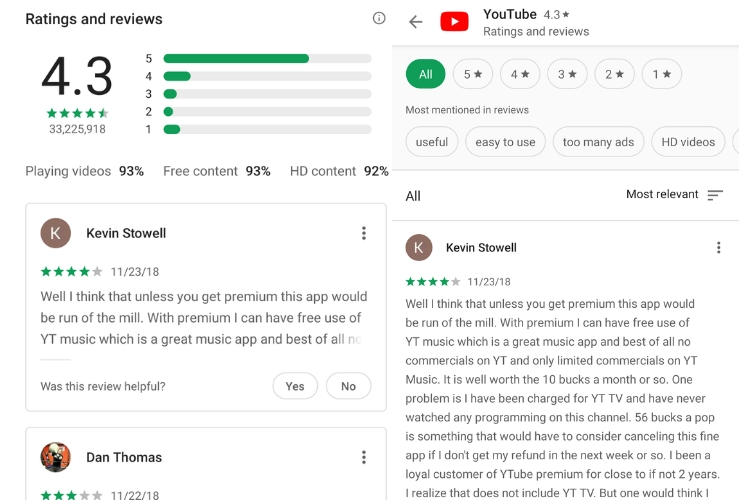 Well, Google has decided to further streamline the Play Store UI and is said to be testing a revamped ‘Ratings and Reviews’ section. As spotted by Reddit user MonogOn, the new ‘Ratings and Reviews’ UI sheds all of the colors that helped distinguish between the ratings and simply embraces the green color along with other Material Theme elements. The rating bar graph now has rounded ends, with a gray background, that helps you see the breakdown of ratings more clearly. The Play Store also opts for a minimalistic approach to displaying the top features which were previously shown in round containers with a circular bar indicator. It now shows the user ratings (in percentage) right next to the feature name, i.e playing videos (93%) or free content (93%) for YouTube. This looks much cleaner and tells you the number of people who have spoken about a certain app feature more clearly. Finally, Google is testing a change to how the reviews are displayed and I’m not really liking it right now. The Play Store is forgoing the ‘Review Highlights’ feature that gave users a sneak peek at the most-valuable feedback right off the bat. However, the new reviews UI now shows your feedback in a card UI, with the most relevant reviews showmn on top. When you jump in to see all the reviews, you get to see the ‘most mentioned words in reviews’ option that replaces review highlights, along with a rating and filter options. 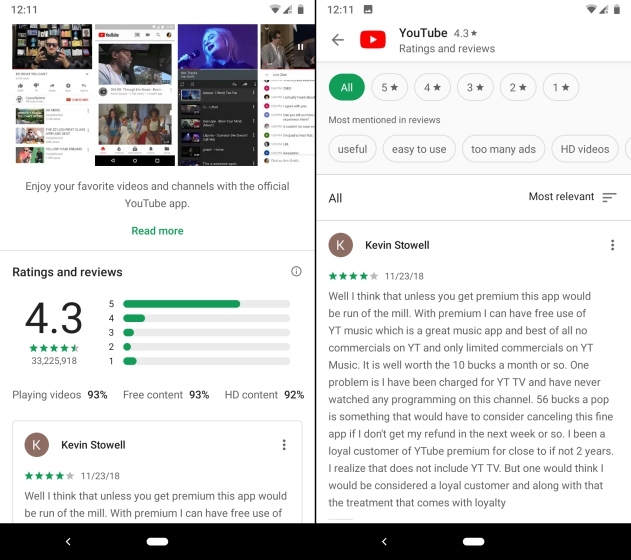 The new ‘Ratings and Reviews’ interface is quite clean and falls in line with all recent changes introduced in the Play Store. The UI is not yet live for all users and Google may just be experimenting with it right now. We’ll let you know as soon as the changes go live.